I know I have been away for a very long time. I have a very good reason though. I had resigned myself to subbing for another school year. I had planned crafting projects and things for my Etsy store. Then on a whim I applied for a teaching position at a private school. Much to my surprise, they interviewed me and hired me. I am now teaching second grade. I love it but it has been very time consuming to set everything up! It seems like I looked up one day and Halloween was already here. In other sad new, my LSS, Felicia's Scrapbooks is closing after six years. I have loved teaching at the store and I will miss it greatly. She has personal reasons for closing but I am sure if more people chose to buy local rather than from the big box store, she would be able to stay open. Speaking of Halloween....I have a Halloween project to share. 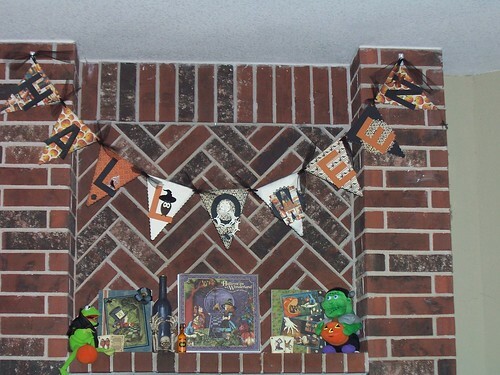 I created at Halloween banner using the Reminice line and lots of Sizzix goodies. It looks really nice hanging on the mantle above the canvas I made a couple years ago.